The computer that you are running PowerPoint on must have 2 or more displays directly connected. To connect 2 displays the computer must have Dual-Head graphics card, to connect 4 displays, the computer requires a Quad-Head graphics card. Single display presentations can still be run in the same way as before. 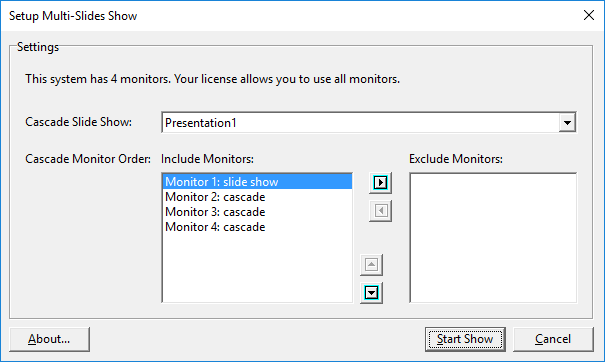 The first time you run Multi-Slides Show, the software will detect the number of displays you have attached and ask you which ones you wish to use for your Multi-Slides Show. Once you have selected which displays you wish to use and select Start Show, the settings will be remembered next time. Click here to download Multi-Slides Show.